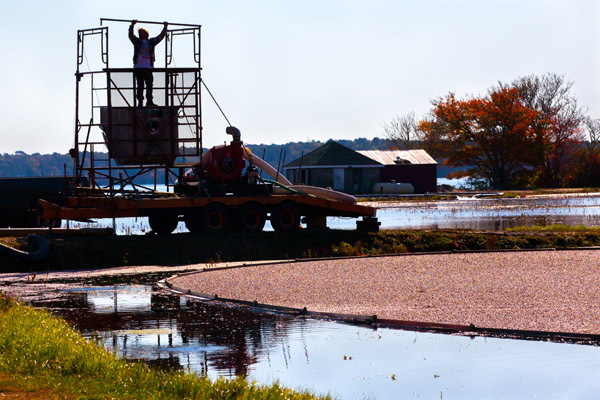 Cape Cod cranberry grower, Ray Thacher, and his crew "rack up" cranberries with booms after flooding a bog in Brewster, MA. 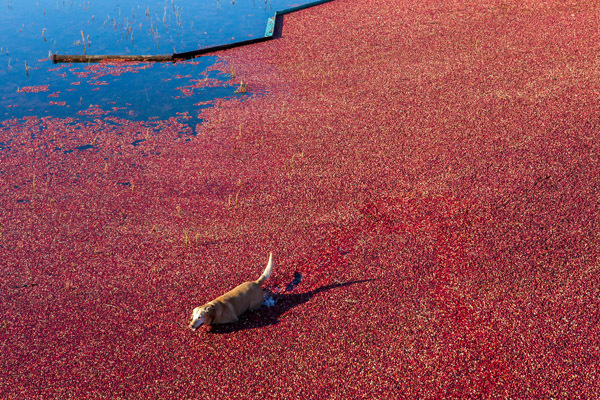 Every fall Cape Cod’s cranberry bogs are transformed from dull fields into a colorful landscape of floating red berries when growers flood the bogs. This October, I spent some time photographing Ray Thacher and his crew as they harvested their berries. 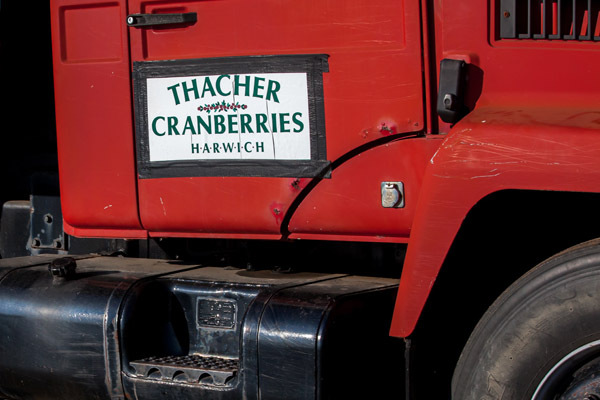 Thacher’s family has been growing cranberries on Cape Cod for over 60 years. As children, he and his two sisters worked with their parents on the bogs just as his own children did when they were growing up. 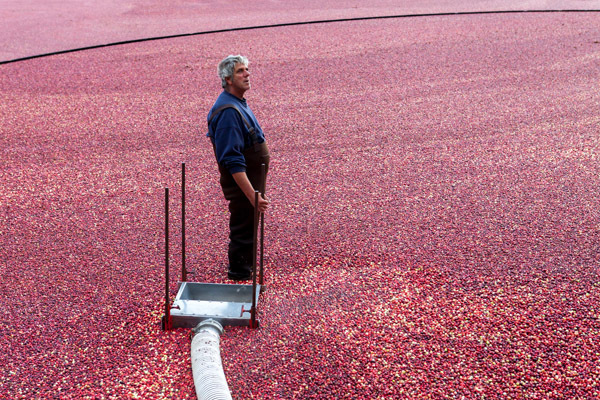 “Growing cranberries means you have to be a farmer, a mechanic, a builder, a painter…you do something different every day,” he says. 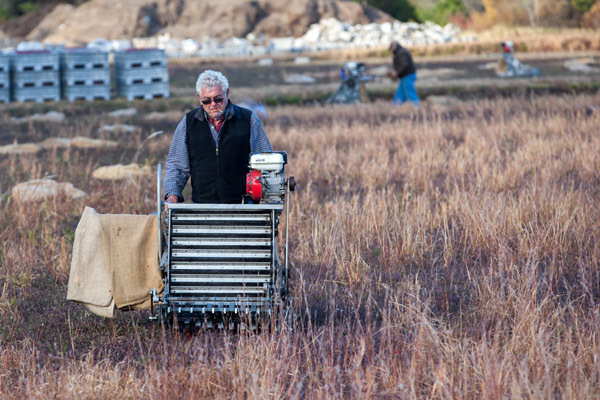 While fall is harvesting season and the most visibly busy time for Thacher and his crew, cranberry farming is demanding year-round. From maintaining bogs and equipment, to setting up sprinklers, monitoring for insects, fertilizing and pruning, dry picking, water picking and accounting, Thacher’s work is never quite done. 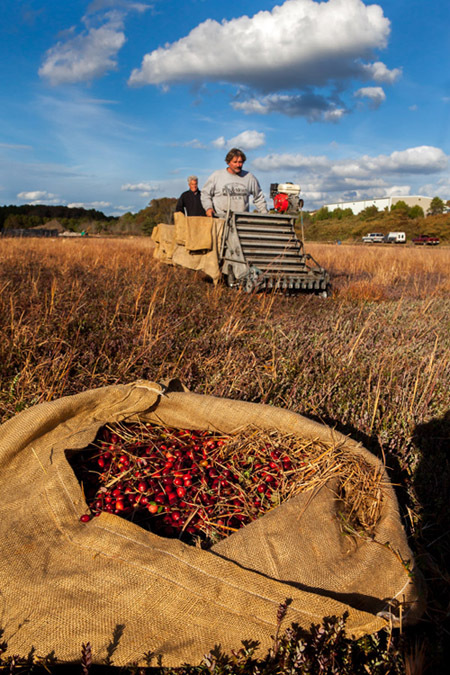 In recent years, cranberry growers have been threatened by a surplus of berries. 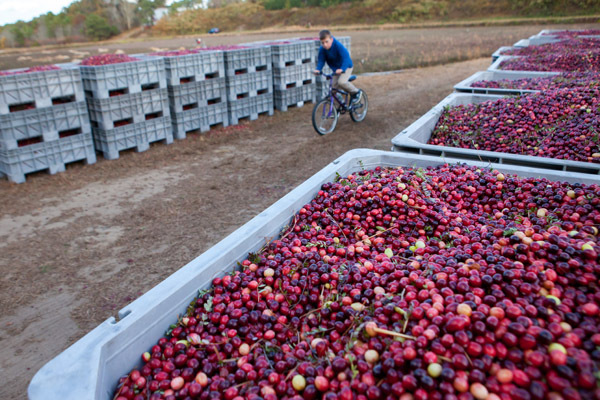 “This can be a huge problem for growers because the price of cranberries plummets and unless you’re part of Ocean Spray–a grower-owned cooperative–you can’t make a profit,” says Thacher. 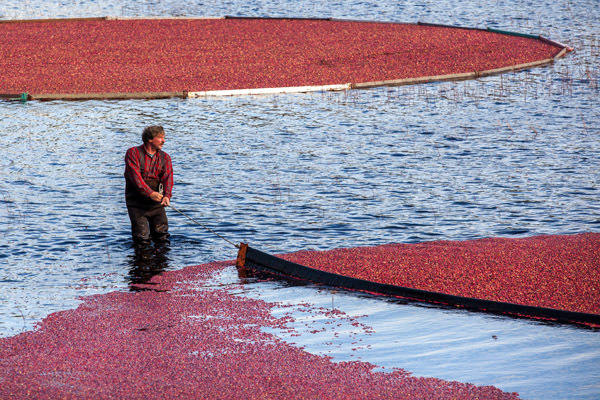 His family is lucky to have joined Ocean Spray decades ago so they are less vulnerable to dips in prices. “It’s sometimes tough working outside in the winter but mostly, it’s great to be growing food (and juice) that is enjoyed world-wide,” says Thacher. During my time photographing Ray and his crew, I was struck by the beauty of the setting and the camaraderie of the crew. Below are some images from my time with them. 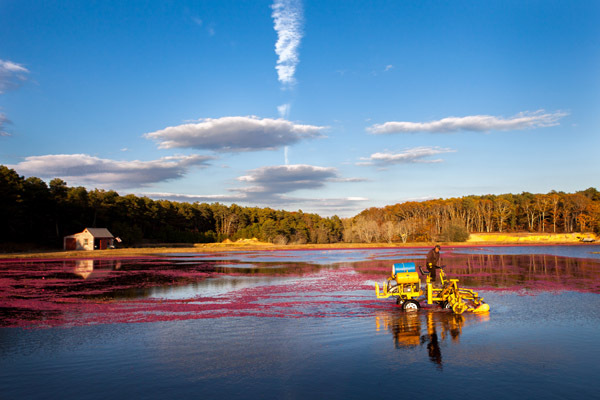 After flooding a bog in Brewster, MA, Ray Thacher uses a water harvester to churn the water and loosen the berries from the cranberry vines below. Apparently, the berries have small air pockets in them that allows them to float to the surface of the water. Ray Thacher corrals berries using a boom. Ray's yellow lab, Hudson, takes a swim in the bog during a wet harvest. Hudson, who is 11 years old, has been going to work with Ray every day since he was a puppy. Ray Thacher sets up the "detrasher" which cleans and separates the berries after they are pumped from the bog. Donald Blakely looks up after getting the mouth of the berry pump into position. 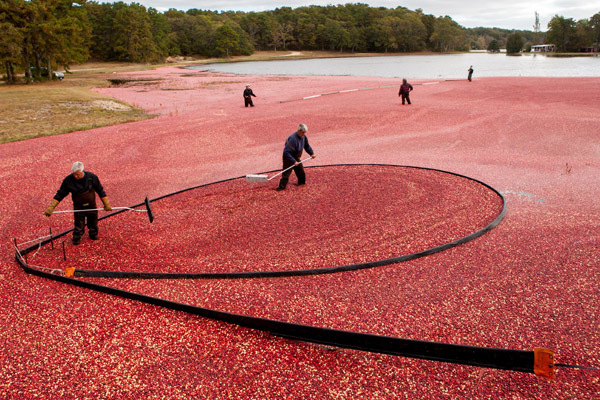 Cranberries are cleaned and separated by the "detrasher" after being pumped from the bog. 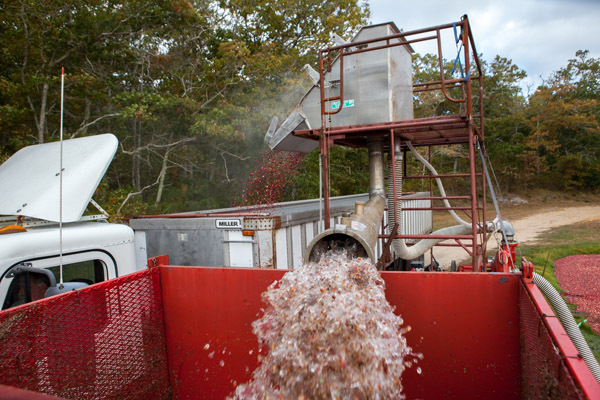 They then are spat into a waiting truck for transportation to the Ocean Spray plant in Carver, MA, where they are either made into concentrate or frozen for future usage. 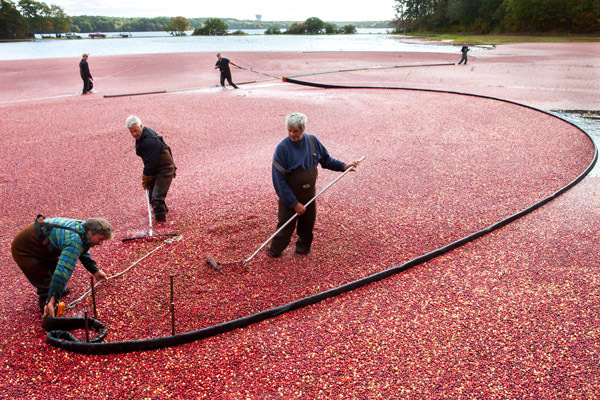 Thacher and his crew rake the berries towards the mouth of the pump. grocery store for use in fresh recipes. Ray’s father, Raymond “Linc” Thacher, enjoys a cigar while helping his son with the dry harvest. 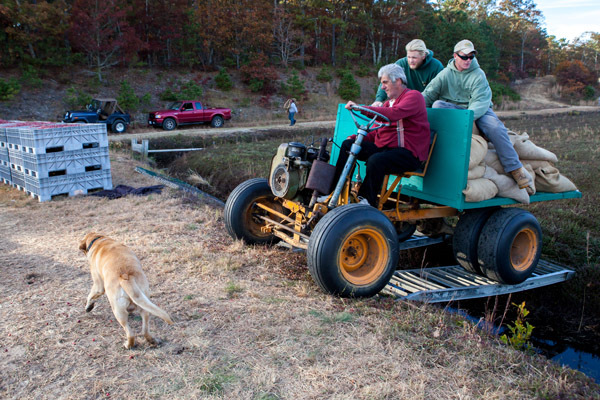 Ray's yellow lab, Hudson, hustles to get out of the way as the crew drives over the bog trench to transport sacks of dry berries to waiting containers. On the tractor are Donald Blakely (driving), Jason Gingras (center) and Nelson Saunders. "Linc" Thacher's grandson, Keegean Knee, bikes past containers of dry berries while waiting for his grandfather to finish up. A sign on the detrasher proudly displays the family's name.